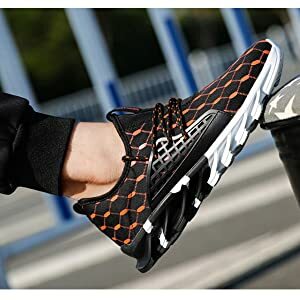 BREATHABLE UPPER:Fashion mesh upper for ultra-lightweight support and breathability can maximizes the upper surface,let your foot always keeps dry and cool. COMFORTABLE INSIDE:Stretch lining to increase comfort and breathability.Cushioned insole and breathable lining give you exceptional support for your performance. EASY FOR WEAR:Flexible outsole gives the foot maximum range in movement.Classic low-top sneaker featuring three-eyelet lace-up closure for easy on and off. ENERGY PROVIDE:Specially engineered outlook and outsole provide your every step full energy, fast and light. ANY OCCASION:Perfect choice to pair with any sport or casual assemble.Suitable for parties,sports,walks,indoors,outdoors,any where. →→When you run, the shoes can absorb the sweat on your feet and help disperse heat, yet they look nothing but fashionable. 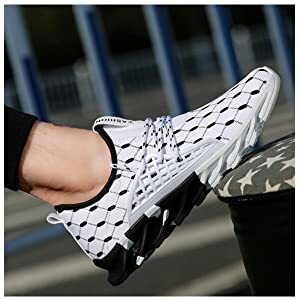 →→Stretch breathable mesh upper expand with your foot when you run and they more comfortable closely fit to help you reduce irritation,you will not feel uncomfortable. →→The inside is filled with soft cotton to enhance the gluing effect,it makes you feel comfortable even you wear for a long time. →→The soles are made with shock-absorbing rubber and extremely flexible.They are elegant yet light.They have moderate suppleness and clear grain design gives them durability and a good grip. →→When you go out for a tour, put on these shoes and you will feel comfortable and free.Your feet are unrestrained.You can run freely and enjoy a pleasant journey.